Many of us are waiting for cold icy weather to go away.........me included. Summer will be here before long and I am wondering if any of you have ever wanted to go for a summer ride but just decided......no way.....it's just too hot to ride. What temperature is too hot for you? WOW !!! I am speaking to superheros here on this forum. When you're hot you're hot. I prefer it to be less than 100F but I will ride in hotter weather if i have a reason. Low temps I don't mind as long as the roads are clear. I agree. We don't get temps over 100 here in North Carolina and so far I can handle it. I try to ride in a pretty wide range of temps but when it gets down into the low 30s and 20s I'm done. I might have been exaggerating just a tiny wee bit. Dry is what I look for. Dale it was still funny and I figured you were joking.....keep your sense of humor going. I've done my limit in NV a bit over 10 years ago I think. I remember seeing a sign after we left LV that said 117º. We were wearing white long sleeve shirts but still were very hot. Was more concerned with the tires than anything else. We saw several cages beside the road with the hoods up. That was the worst suffering I've ever done on a bike. I knew what my limit was then. But having said that is my limit, I still try to avoid anything past the 100ºF mark. A good spray bottle with water works wonders once temps are that high. I'm seriously considering investing on one of those cooling vests. Someone with more experience in the cooling off gear could give some good advice here. 117? I can only imagine what that was like. The spray bottle sounds like a great idea...and cheap. I have used cooling vests in the past but not for motorcycling. They do the job but sometimes a little too good if you are speaking of the "ice pack" type. Those things keep your core temperature low but certain places on your skin get real cold. Thank you for your advice. In the late 60's I attended New Mexico State University in Las Cruces NM. I rode a Suzuki T500. Temp got around 115° in the summer months. Rode my bike everywhere. Too young to worry about the temp. In summer I usually wear one of the two Hein Gericke mesh panelled textile suits I have. They're fine but as the jackets are fitted with back protectors, they cover a large surface area of skin that can't breathe in hot weather. I don't wear cotton T shirts as they just absorb sweat, but with a vented back protector even a synthetic T shirt gets damp. It can get uncomfortable, but it's preferable to getting road rash or a lot worse riding in casual wear. So after thinking about a solution for a long time, I picked up a Macna Dry Cooling Vest at a very good price late last year. Unlike cooling gear you have to soak, you add half a litre of tap water through a valve and squeeze the best to distribute the water through the lining. The vest stays dry and the cooling effect works for about three days, whether it'll get use much use this year I've no idea. It's just another kit option like my heated jacket is at this time of year. Although, on one of the two trips my wife and I took from MN to FL we had some hot and muggy weather on the way back down in Mississippi. The temp was near 100 and the humidity was almost the same. We hit 3 stretches of rain about 3 miles each. It was so hot we didn't stop to put on any rain gear. The highway turned to two ribbons of steam. It looked kind of weird. After a mile or so after the rain stopped we were dry again. We also stopped about every hour to hit a restaurant to get into the A/C and drink lots of water. I think they guessed that we weren't from around that area. Maybe our accent gave us away. One guy said, "Not used to the heat are you"? I said, "We usually don't get this kind in MN too much". None of them seemed to mind the heat but then they were used to it just like my sisters in FL. That was the first trip. The second trip wasn't nearly that hot and was pretty pleasant with the exception of hitting about 150 miles of rain total on that ride. We had to stop a couple of times under an overpass because it was coming down so hard you couldn't see. Needless to say we enjoyed both trips and were young enough to handle it. Now that she's gone there are times I can still "feel" her on the back of the SWing. I turn my head and ask if she's enjoying the ride and haven't gotten hit in the head so maybe she does still like riding with me. 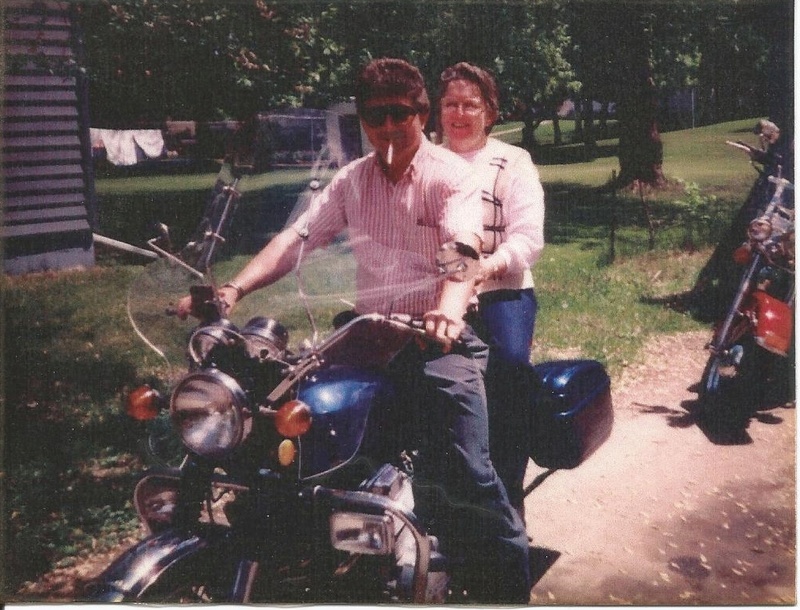 This is us on my 74 Honda CB750 the first one we rode to FL. The Harley in the back was my friend's son's bike. 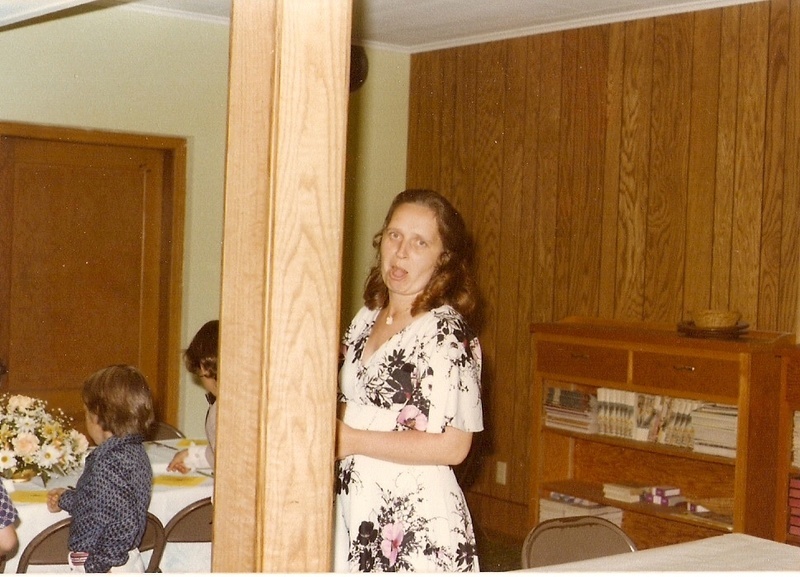 The other photo is one of my favorites of Jan with my two son's heads in the background. 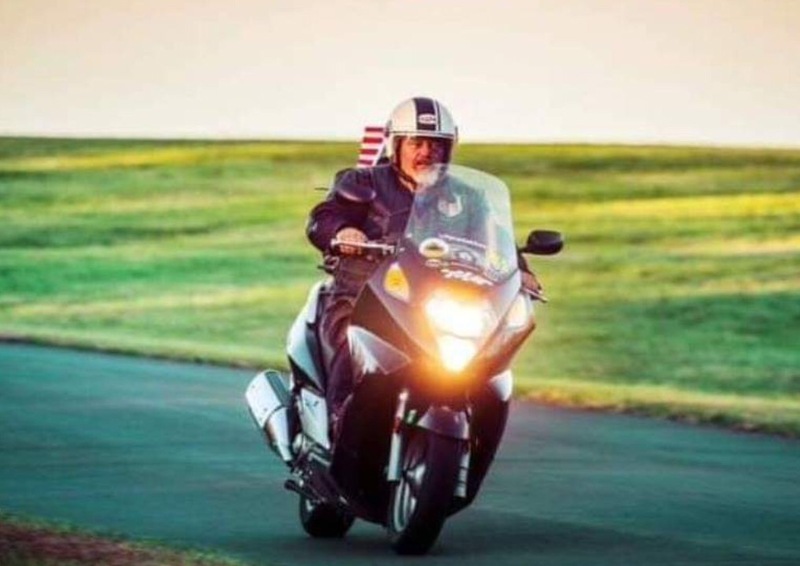 Having lived and ridden in tropics (Okinawa) and lived/rode on Yuma Proving Ground, now humid TN----no temp is too hot----you need to protect yourself from sun, drink water and keep moving. Selection of helmet important---I am surprised my Aerostich Darien Jacket works to 90 degrees F as long as I am moving. Never had much luck with Mesh stuff---as there are hot spots were it isn't mesh. I can't imagine it being too hot to ride when I am waiting for this Spring to get going. I would have to say mid 30's for me. I remember a few days like that the odd summer. Right now I feel ready to ride in whatever hot weather, just to get warm. I am really enjoying this thread. Lots of good advice and thanks to Dale for the vintage photos. I love vintage photos. Even though Swing is more forgiving re heat from engine than other bikes, anything above 92F is approaching too hot for me, even with mesh jacket with "armor" that I always wear. But that spray bottle is a good idea, and may increase my high temp limits. Of course, flip flops, shorts, bare chest and no helmet = no temperature limit for some folks. Dale at least you've GOT hair. Bob and I left for a trip in July 2012. We were having a heatwave in Chicago. The day we were leaving the heatwave was suppose to break. Ha! that didn’t happen. We rode through IN and OH about 450 miles till we finally got to the State Park we were camping in close to dusk. According to our Temp gauge were riding in 107° heat on the interstate. Took us forever to get there because of all the stops for water and to cool off. It was not pleasant. When we were setting up the tent Bob had heat exhaustion and had to stop and take a cold shower for 30 minutes. It was a very sticky humid night in the tent. I won’t camp in that kind of heat anymore and I also don’t like riding when it is around a 100°. Only if I am already on a trip and need to get somewhere. If I am home and it is that hot I will take a pass. A couple of years ago Bob and I picked up the Macna cooling vests on clearance. They work well as Meldrew has said. They pack up nice. Glad we have them for those hot days. 107....Whew. That had to be miserable. I agree that up to 100 is feasible but beyond that..........well..........only if I had to. Thank you for a very informative and interesting post CathyN. My brother and I had a hot ride in Nevada on one road trip. The temperature was hovering around 107F. It proved the value of my water vest. You soak the thing in water and wear it under a mesh jacket. It provides over an hour of blessed cooling once you get moving. Without the mesh jacket over it the cooling effect in 100+F weather only lasts about twenty to thirty minutes riding at highway speed. I got mine (an earlier version) from Revzilla. Not cheap but worth every cent if you ride in blast furnace conditions. I hear more and more about the cooling vests. I'm going to look into one of those. Thank you. I live in the American Southwest desert (New Mexico). Routine summer ambient temperatures can and often do exceed 100 deg F with a low relative humidity (hey, its the desert). I wouldn't hazard a guess what the temperature of the tarmac/blacktop would be, but do recall news stories of temps greater than 150-160's. My only issue in riding in really hot weather is the rubber handle grips soften and slip on the metal handlebar.